View That Deal is an application that many users install on their systems because they think that it can help them to save money and time at online stores. It claims that it will do that by delivering the best deals straight to users’ browsers; however, users notice very quickly that it just shows various commercial advertisements on their screens. We also believe that this program has not been published to help users save money. Therefore, we suggest erasing View That Deal as soon as possible. It would be best if you do that as quickly as possible because it is known that this program can cause harm to your system instead of helping you to save money while shopping online. The program installs extensions to all the major browsers; however, it seems that you will be able to remove it via Control Panel. You will find more information on the removal of this adware further in this article. Researchers have found out that View That Deal belongs to the Lyrics family, so it is not surprising at all that this program only shows commercial advertisements. These ads will be based on the information about your browsing activities, so you might find them really appealing. Even though they look decent, we still do not recommend clicking on ads because you might be exposed to malicious software. Malware will not enter your system the moment you click on some kind of advertisement; however, there is a huge possibility that you will end up on an untrustworthy website after doing that. You might easily download malware on your computer if you surf such a web page. We suggest that you erase View That Deal not only because it shows ads that might cause harm to your PC and is useless, but also because this program collects information about a user’s online behavior. It seems that it uses the gathered data to show you relevant ads, but it is still not completely clear whether it does not use it for bad purposes. 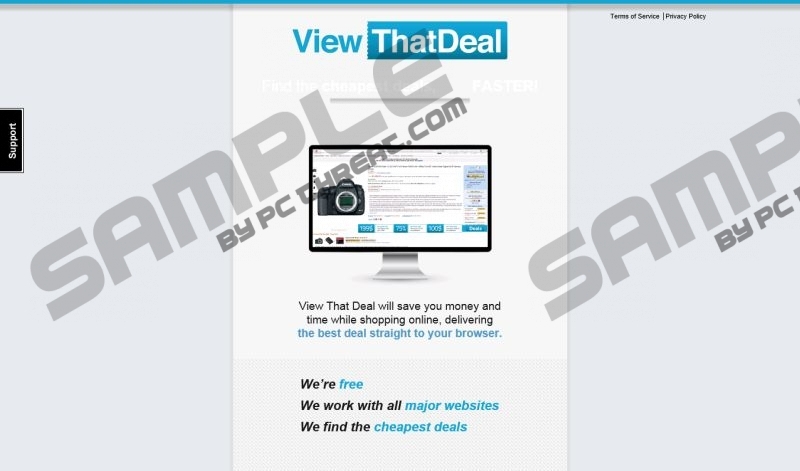 There is the Download button on the official website of View That Deal; however, nothing happens after users click on it. Therefore, we believe that it usually travels bundled with other programs and enters systems together with them. In fact, other untrustworthy programs can enter your system without your permission too, so you should not forget to install a trustworthy antimalware tool on the system. Some users say that they can protect their systems themselves; however, we do not think that it is true because it is a really difficult job. In order to be safe 24/7, you should invest in SpyHunter or a similar reliable tool because suspicious security applications do not do anything useful and might download malware on your PC. You can easily remove View That Deal via Control Panel; however, if you have never removed any kind of program, we recommend using our manual removal instructions. If this is still too difficult for you to erase View That Deal yourself, you can scan your PC with an automatic malware remover, such as SpyHunter. It will eliminate all the existing threats within a few seconds. Quick & tested solution for View That Deal removal.